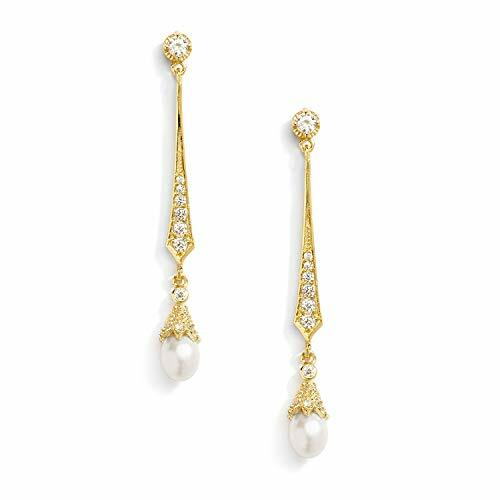 Make an unforgettable grand entrance wearing these graceful Genuine 14K Gold vintage-inspired freshwater pearl and CZ earrings by Mariell. These top-selling bridal earrings for weddings and special occasions feature soft cream genuine freshwater pearl drops in a beautiful slender silhouette. They glisten with the finest grade AAAAA quality Cubic Zirconia gems. We love the dress up or dress down versatility of these graceful dangles as they seamlessly transition from day to evening wear. With meticulous craftsmanship and Mariell's exclusive Lifetime Guarantee, you'll enjoy years of sparkling wear long after the special day. We promise you'll love these popular designer dangle earrings or your money-back. Treat yourself or someone you love to some seriously gorgeous glamour. Risk-Free Money Back Guarantee.